Micro-Epsilon: The new, confocal chromatic confocalDT IFS2404-2 sensor is used for high precision distance and thickness measurements of transparent materials. With a diameter of just 12 mm, the sensor can also be integrated into restricted installation space. The innovative lens enables high measurement accuracy and a small light spot diameter. Due to a special lens technology, the confocalDT IFS2404-2 provides high resolutions at a small light spot size. Together with the confocalDT 2421/2422 controller, the new sensor offers an excellent price/performance ratio for OEM purposes. The confocalDT 2421 and 2422 controllers from Micro-Epsilon set new industrial standards in precision, confocal measurement technology. 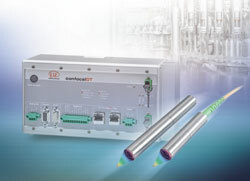 Available as either a single- or a dual-channel version, these confocal chromatic measuring systems are an economical solution, particularly for high volume applications. They operate on a non-contact and therefore wear-free basis while the active exposure regulation feature in the CCD line accurately and rapidly compensates for changing surfaces.